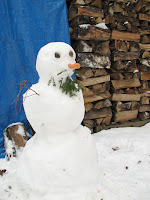 LittleBirder and his Dadda built this fellow to watch over our woodpile. I'm not sure whether I love the carrot nose or the hemlock beard more. Just wonderful. This pic is a little blurry at this auto-resize; you might want to click to see the larger one.